You will need to apply for a driver's license in person at an Iowa DOT office. You will need to provide various documents, pay the required fee, and pass the vision, written, and driving exams. This page will help you apply for your first driver's license from the Iowa Department of Transportation (DOT). NOTE: If you're younger than 18 years old, you will need to complete the graduated driver's license (GDL) program. See our page on Applying for a New License (Teen Drivers) in Iowa for more information. If you've just moved to Iowa and have a valid (or recently expired) driver's license from your previous state, you will be able to obtain an IA driver's license without having to pass the driving and written knowledge tests. You will need to bring all documents and payment as outlined below as well as surrender your out-of-state driver's license. If your out-of-state driver's license is invalid or has been expired for longer than 1 year, you will need to pass the written test. If you're not a U.S. citizen, you will only be eligible for an IA driver's license if your legal stay in the country is for at least 30 days. If you are authorized for employment, you MUST have a Social Security number (SSN). Pass all DMV tests (vision, written, and driving). NOTE: The length of your driver's license will depend on the length of your stay in the United States. Non-commercial driver's license (Class C). To be eligible for a non-commercial driver's license, you must be at least 18 years old, or have completed the GDL program. Foreign passport with print out of I-94. Pay the fee of $4 per year of validity. Your driver's license will be valid for up to 8 years. To find out exactly what documents you will need to bring, visit the IA DOT website. Before the Iowa Department of Transportation (DOT) will issue you your driver's license, you must pass both a written knowledge and a driving test. The written exam will test you on your knowledge of local traffic laws, safe driving practices, and road signs. Questions will be based on information found in the Iowa Driver's Manual. 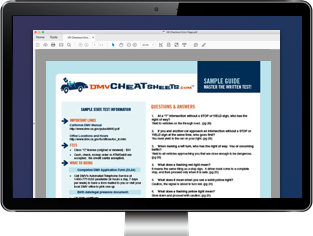 The MVD provides a basic practice test to help you prepare for the written exam. If you want to ensure passing on your first attempt we suggest using an online practice testfrom our certified partner. The driving test will test your ability to drive your vehicle safely on public roads. You will need to provide your own working and registered vehicle and have insurance coverage. NOTE: You will need to show a registration receipt and insurance card. If you fail either of the exams, ask when you will be able to re-take the test again, as there may be a waiting period.